Impressive. 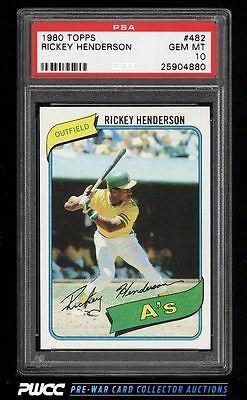 A dead centered and exceptionally high grade Henderson RC which embodies arguably the single most important baseball investment piece from the 1980s. Henderson represents one of the most well rounded performers in the history of baseball and is unanimously regarded as the single greatest leadoff hitter in the history of baseball. Many of us recall the era where a lead-off walk essentially guaranteed Rickey a double as a steal to 2nd was certifiably inevitable. All told this card is a special offering and the first PSA 10 we've had the pleasure of brokering in our history. This comes with our highest recommendation. Part of an outstanding, high grade run of Henderson rookies on the auction block this month. One of nearly 20,000 cards, lots, and sets up for bid in our 7th Auction of 2016. Click on the link above to view the other PWCC auction lots.